SAN DIEGO — Bill Rose woke up from a nap August 15 with searing pain in his lower back. 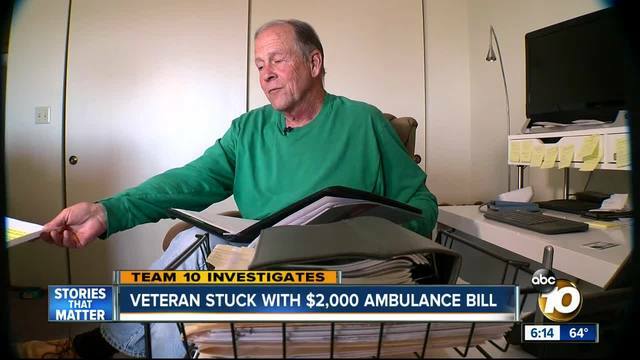 The 70-year old Vietnam Veteran felt sure he was suffering a potentially fatal condition. It felt like blood was filling his body cavity. "You've got seconds to live," he thought, and called 911. An ambulance rushed him to the hospital, just blocks away. Emergency room doctors determined Rose had a painful infection, which was treated with antibiotics. He was sent home. Rose was stunned when the bills started showing up in his mailbox. The ambulance bill was $1,973.76. His three hours in the hospital emergency room cost $12,302. The news got worse: Rose soon found out the Veteran's Administration won't pick up the tab. "I'm retired and on social security," Rose told Team 10, adding there was no way he could afford to pay for what he believed was a life-threatening emergency. Rose took his bills and paperwork to the VA, along with a print-out that says the VA will cover claims for veterans who need emergency care at the nearest hospital, even if it's not run by the Veteran's Administration. Rose didn't realize the VA won't pay medical claims if the veteran has outside insurance. Rose has Medicare Part A. He says a patient advocate told him the claim was denied, but that's not what a VA representative told Team 10. Because Rose is a Medicare recipient, the representative told Team 10, his claims do not qualify for payment. He explained Rose's claim was suspended pending a ruling on the Mill Bill's implications for veterans who have other health insurance. The U.S. Court of Appeals ruled last April that the Department of Veteran's Affairs was wrong to ignore a revision to the law in 2010 that aimed at making sure veterans didn't have to pay out-of-pocket for emergency care that their private insurance might not cover. According to an article in Stars and Stripes, millions of veterans could be eligible for VA reimbursement. "I went there in good faith that the VA was going to pay for services at the nearest facility," said Rose. "completely untrue. Of course, I feel betrayed." Rose held up a fact sheet from the VA titled: "Non-VA Emergency Care Fact Sheet"
"I realize its not a perfect world, but there is such a thing as blatant fraud and as far as I'm concerned, sending out a flyer like this to all veterans and then not honoring the commitment is outright fraud." Collections agencies have already started calling Rose at all hours of the day and night. He's hoping the VA takes care of his emergency care bills before his credit and reputation are ruined. "We looked into Mr. Rose’s issue, and the rate we charged is our contracted rate for the City of San Diego. Mr. Rose has Medicare Part A, which does not cover emergency medical transports. AMR does have a compassionate care program for patients that qualify, and we will work with Mr. Rose to determine if he can benefit from this program if the VA ultimately declines coverage. To date, our system does not show any VA denial for Mr. Rose."